A HI-TECH urban training facility normally reserved for special forces units should be made available for all soldiers, military commanders have said. Army officers and experienced troops have issued the plea after reserve troops from Portsmouth had the rare opportunity to use a ‘shoot house’ in Denmark. The facility is a purpose-built indoor arena, designed to help soldiers sharpen their urban warfighting skills. Hidden away in a barn on the Oksboel training area on the Denmark’s east coast, the site features an array of rooms, corridors and stairwells for troops to fight through in mock battles with weapons firing simunition rounds - similar to paintballs. State-of-the-art electronics can control the lighting and sounds inside, while jets can pump in smoke and even scents like rotting corpses or cordite. It’s all used to help acclimatise troops to the conditions they might face fighting through buildings in cities, day and night. 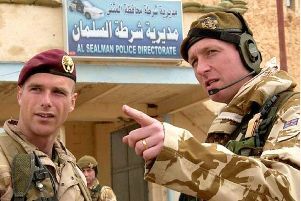 Britain currently has two similar facilities reserved to train special forces operators from the SAS and SBS. But after seeing the facility being used by 4th Battalion, The Princess of Wales’s Royal Regiment (4 PWRR), soldiers now want the UK to create more sites for other troops to use. Colour Sergeant Christopher Bramhall was part of the team from 4 PWRR taking the 120 reserve soldiers through the ‘shoot house’ during their two-week deployment to Denmark. He said the benefits of such a facility were immeasurable when it came to preparing troops to deal with urban warzones. He said: ‘Straightaway they can see how difficult it is. IT’S pitch black inside and deathly quiet. I’m standing on a metal catwalk inside a huge barn. Below me is a complicated maze of corridors and rooms that I have a bird’s eye view of. Next to me are two military officers in their green fatigues. They’re wearing industrial ear defenders. One reminds me to lower mine - just in time, too. As soon as I slip my ear protection on the entire barn is shaken by the piercing sounds of snarling dogs growling and barking, gunfire and people screaming. Even with the protection it’s intensely loud, being blasted out over industrial-sized speakers dotted across the barn. Disorienting strobe lights begin flashing, wreaking havoc with my natural night vision. Below me I can just about make out figures moving in the dark - six men, armed with guns and wearing masks. Red lasers cut through the barn’s smoky haze as they move and stack up against a wall below me. One tosses a grenade into the room before the rest burst in, shooting two enemies inside with dummy simunition rounds - similar to those fired by paintball guns. It’s fast. The soldiers’ shouts of ‘room clear!’ and ‘moving!’ are just about heard over the din. I watch as they move up the stairs - and set off a booby trap which explodes with a sudden flash of light. Another squad moves on up and continues fighting with an alerted enemy in a room upstairs. Through small windows I can see three of the soldiers charge into the room, firing at the enemy, eliminating them. It was loud, chaotic and far from a perfect performance. But it was a lesson the soldiers will never forget - war isn’t easy or pretty.